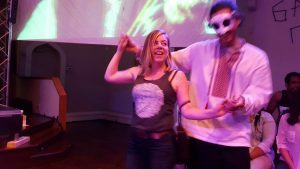 There was joy and dancing. There was singing and dancing and borscht. There was violence and death. 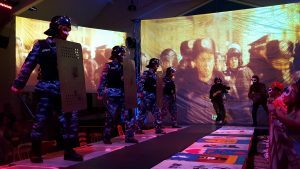 Ukraine’s Maidan Revolution was a complex progression of populist protest, community gathering, and deadly serious revolution that cost people their lives. 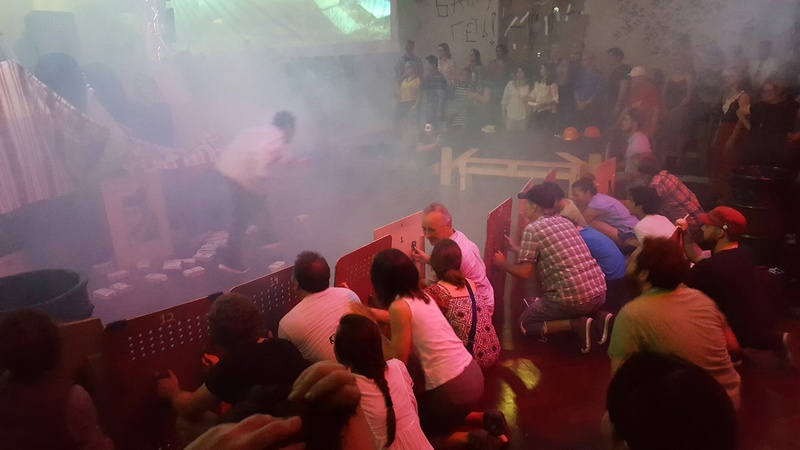 Counting Sheep, the interactive “guerrilla folk opera,” brilliantly portrays Ukrainians’ hopes for a better future as they stand up against their corrupt president, their determination that the protest remain peaceful, and then their perseverance as the Berkut (riot police) begin using deadly force against them. When people ask me, “Are you Ukrainian?” my answer is usually, “Yes, in spirit.” As a lover of Ukraine, I know more than the average American about the Maidan Revolution. I followed Ukrainian news sources daily during the Revolution, networked with friends (existing and new) on the scene, and participated in local protests. I visited Maidan for myself in the fall of 2014, walking along the wall of memorials for the Heavenly Hundred, accompanied by a friend who told me stories about the people who’d been killed. The protesters face off against the Berkut. The performance takes place against a back drop of actual video footage of the Maidan Revolution. 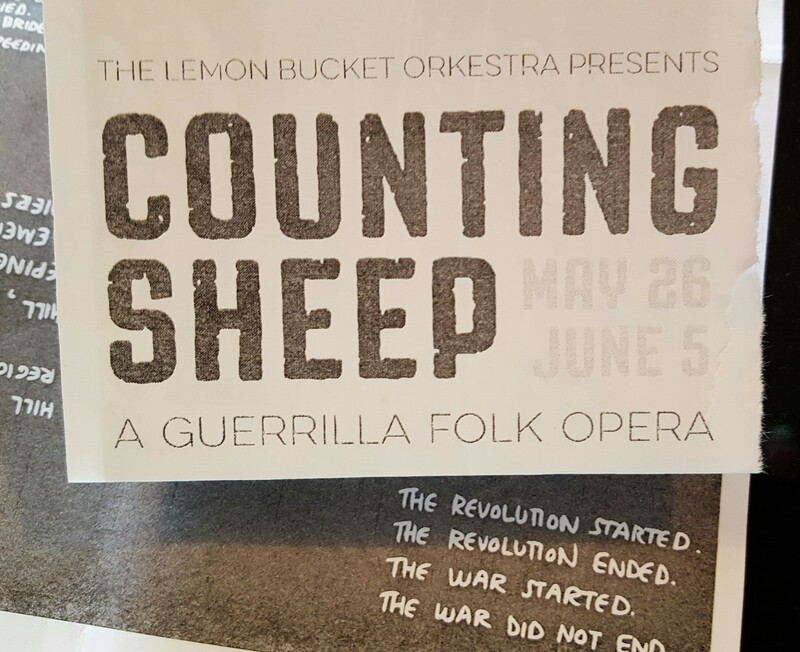 But after seeing and participating in Counting Sheep, created by Maidan veterans Mark and Marichka Marczyk and performed by Lemon Bucket Orkestra, I understand Maidan even more. In a small (and much safer) way, I feel like I was there in the middle of the revolution. I better understand the moments of joy and community that existed in the reality of Maidan, when most of the media coverage focused more on Molotov cocktails, overturned buses, and walls of fire from burning tires. This is not a performance to go to as a detached audience member. I was eating borscht with friends (despite going to the performance alone, I’d gained new Georgian, Ukrainian, and anti-Putin Russian friends by the time it started). I was tapping my foot to the music and laughing with the dancers. Then, wham! A Berkut slaps a baton in front of us and we’re forced to flee as a battle breaks out. I joined in building the barricades, frantically passing tires from one person to the next to create a protective shield between us and the guns of the Berkut. The security of having the barricades in place brings a respite—and a wedding celebration. I swallow my last bite of vareniki and toss my plate away as I’m flung into a wild wedding dance … and then the shots ring out and we flee again. I think the most poignant point was that moment of realization when it became clear that all the protesters’ idealistic hopes, all their joy at working together for a brighter future for Ukraine, had resulted in death by sniper fire; peace and joy had turned to war and mourning. 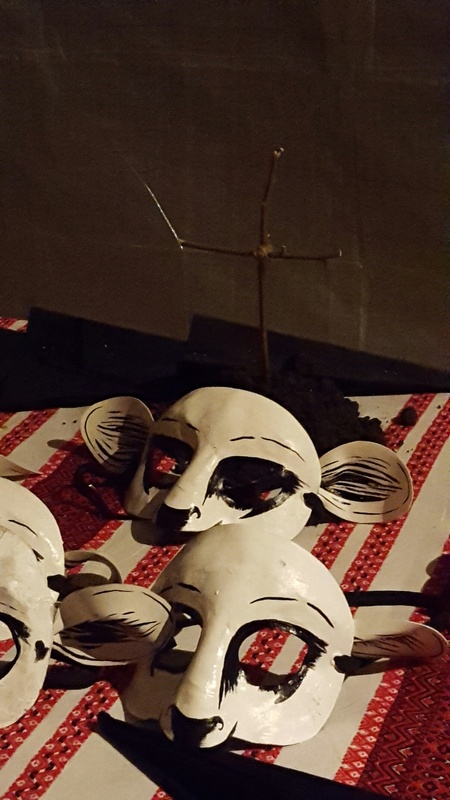 The performance ends as we walk in funeral procession for those killed at Maidan, and then continue on to eastern Ukraine (actually a room in the basement of the venue), where the remaining “sheep” take up arms to defend their country from Russian invaders. Ukrainians have long been an enduring people—war, famine, Soviet oppression. Maybe their very need to endure has been the reason that they seize joy so fiercely. But Maidan turned long-suffering endurance to a hardened resoluteness to fight for freedom. The deaths at Maidan may have been a loss of idealistic hopes, but they became the birth of a determination never again to let dictators and corruption rule their lives. 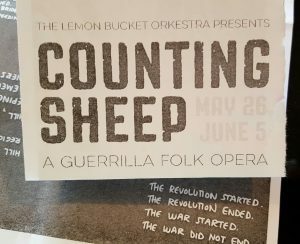 Counting Sheep helps you experience the joy and the terror of revolution. Playing in Toronto through June 5, and in Edinburgh, Scotland, in August. If you don’t know the story of Ukraine’s Maidan Revolution, it started in November 2013 when then-President Yanukovych refused to pursue an association agreement with the European Union. It ended in February 2014 with the deaths of about 100 protestors from government sniper fire. Within days, Yanukovych had fled the country and an interim president was installed until elections could be held. In March 2014, Russia illegally annexed Crimea and invaded the Donbas (eastern Ukraine) under the guise of a Ukrainian separatist movement. Crimea and the Donbas continue to be occupied by Russia. The government, under a newly elected president and Parliament, stumbles toward reform.